Trauma International will accept submissions only through its online article submission System “Scripture” which is developed by Indian Orthopaedic Research Group IORG for the Trauma International. Registration and login to SCRIPTURE is required to submit articles to Trauma International and to check the status of current submissions. While Registering with Scripture please click on register as ‘AUTHOR’. Article Publishing charges for Trauma International : 6000 INR or 150$ (for international article). 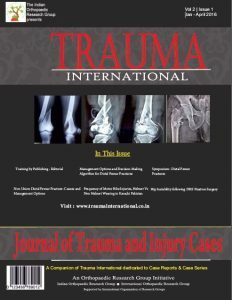 Trauma International will maintain the open access policy and will continue to run with contribution from authors and donations from Orthopaedic Research Group.